I’ve been living just off of Mare Street for two years now, and in that short time, it has changed hugely. Before it was just chicken shops and Icelands with a few divey pubs to mix things up , not forgetting the irony-laden and Hipster filled Dolphin that recently celebrated its 10th birthday. Now there’s the Hackney Picturehouse which brings the crowds in all week long and more recently there have been some seriously decent foodie openings too – including Bouchon Fourchette that serves up stripped-back French food with a focus on wine and now a brand spanking new burger joint called The Advisory. Right next door to the infamous Dolphin, it’s easy to miss The Advisory as in true east-London secretive style, there’s no signage. In fact, the shopfront still denotes what the premises once was – The Asian Womens Advisory Service. More irony in the stickers and posters that adorn the windows and walls inside – which are perfect Instagram fodder for trendy patrons. Decor is really simple, like they’ve just moved in and haven’t decorated, but this works. Exposed brick, mis-matched wooden furniture, bare lightbulbs hanging from dangling wires, menu scrawled in chalk on the walls – you know the Hackney drill. We were there for 8pm and it was rather quite, but by the time we left all of the modest 8 tables were full and there were people standing at the makeshift bar. Burgers are hard to do in London as there is SO much competition. Lucky Chip, Patty & Bun, Meat Liquor, and Goodmans all do a bloody great job. And the burger and bun served up at The Advisory wasn’t half bad compared to the big boys. A toasted brioche bun that was big enough to comfortably hold everything inside that stayed firm from beginning to end. There’s nothing I hate more than soggy baps. Accompaniments in the cheeseburger included tomato, the right amount of lettuce leaves, all important gherkin slices and deliciously strong cheese. Decent cheese like blue or Montery Jack often come at a premium, so it was good to have some serious flavour included as standard. On to the meat and although flavoursome and a nice sized thick patty, it was over-cooked. 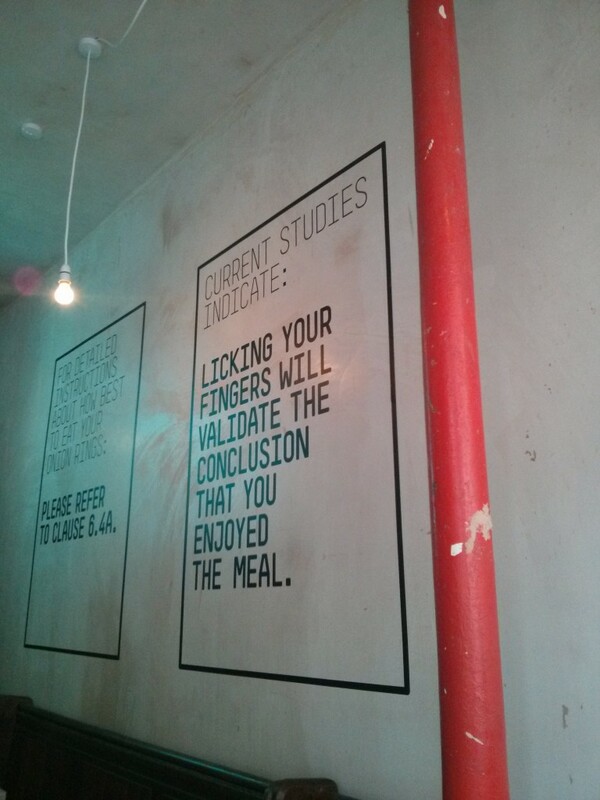 It clearly says on the menu that the burger comes medium-rare, but there was no pink to be seen. bit of a mistake as they were KFC deep-fried style and the coating didn’t taste of much apart from the oil it was cooked in. The little meat that was on the wings had been incinerated and the chilli garnish did little to help the flavour. Things were saved slightly on the sides-front with the greens that we ordered. Large slices of thick leaves, sauteed in butter and chilli and seasoned well. The Advisory had been open less than a week when we visited, so there were a few things to iron out with the service. A glass out white wine came out when I ordered red and some items listed on the menu weren’t available. However our waitress was smiley and helpful with our orders and the discrepancies were put right promptly. 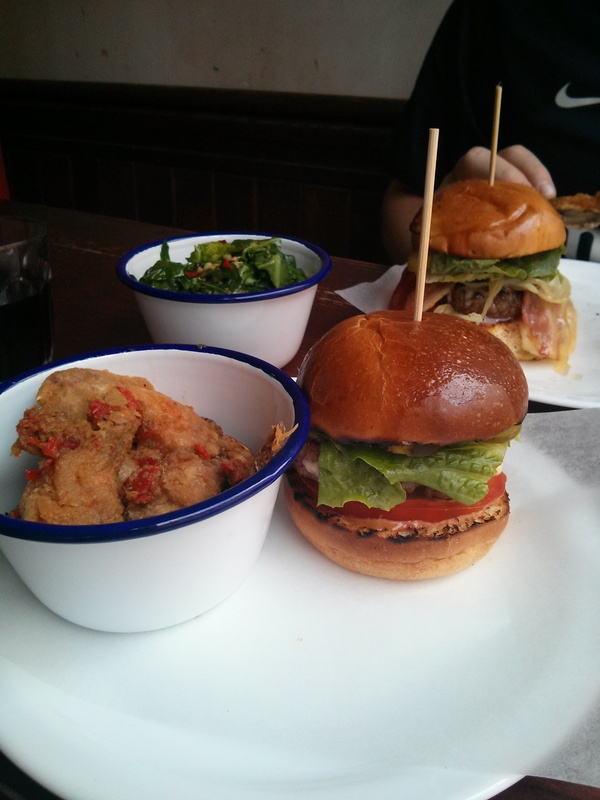 Two burgers, chicken wings, greens, a glass of wine and a beer came to £27. Cool decor, great value for money and being just around the corner will bring me back to The Advisory for my local burger fix. But I will make a point of asking for my burger medium-rare and pink in the middle and will avoid the chicken wings unless they change the recipe. A closed down Women’s Advisory Service in Hackney is now a hipster burger place – this is the one of the worst examples of gentrification. Just awful. The whole thing is very offensive. Your blog suggests that you don’t understand the controversy. Check out the Twitter backlash for more. Hi Jenny. I definitely do understand the backlash and the bad taste of the new owners leaving the old sign visible. However, my blog is a food blog and so that’s what I was focussing on in this post. I cycled past yesterday and think I saw that they’d painted over? Thanks for tour comments. That used to be an advice centre, do people think it’s funny that an Asian women’s advice centre has closed down? Is yet another bar more important? Does anyone give a damn about the women who used to use the centre? It feels to me like the bar is laughing at them and celebrating the fact that nearly every place in Hackney that used to be about helping people, or coming together, is now just a venue for spending money and being cool.